My favorite movie of all time is "It's A Wonderful Life." It gets me every time right in the craw. Remember the big pot of cash the neighbors brought in to George Bailey so he could keep the Building and Loan going. Well, that's how I think America should be. Every hard working American deserves a break. What George Bailey did not need was the government stealing from his neighbors so that he could go to College and to heck with Bedford Falls (Pottersville). Yes, it would have been Pottersville if George had not stayed to help all the people in Bedford Falls. No matter who you are, in your private moments you want to live in Bedford Falls -- even if your last name is Potter. Government intervention creates Pottersville's and good neighbors create the likes of Bedford Falls. Let's let good people be good people again rather than taking so much from them that Mr. Potter is the only one left with any money, and instead of America we end up with a Potterica. Mr. Smith Goes to Washington exudes the same emotion from the viewer. It was another of Frank Capra's big hits and Jimmy Stewart as Jefferson Smith is as down to earth as George Bailey. I don't propose that I can do as good a job for Pennsylvania as Jefferson Smith did for his constituency but I am as much a babe in the woods as far as Politics go as Mr. Smith. I am running for Office to help fight the same type of corruption that Smith faced when he went to Washington. I am up to the task and I am ready to fight to make America, America again. There is nothing separating me from my chance other than a primary and a general election and your two votes. I thank you very much in advance for those votes. My name is Mr. Smith, and I am going to Washington. You know that I can't get there without your help. 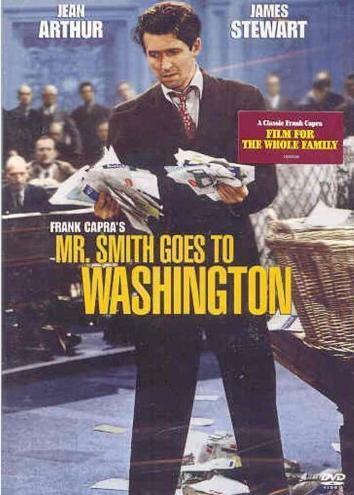 Think of the corrupt conditions that existed in this famous movie as Mr. Smith, played by Jimmy Stewart was a bumpkin when he first went into this Washington den of iniquity -- for him it was the Senate. He was the naive and idealistic Jefferson Smith, the leader of the Boy Rangers. In Washington, Smith soon discovered many of the shortcomings of the political process as his earnest goal of a national boys' camp leads to a conflict with the state's corrupt political boss, Jim Taylor. Taylor first tries to corrupt Smith and then later attempts to destroy Smith through a made-up scandal. Smith conducts a filibuster and finally sways everybody to not pass the "Obamacare Bill." Wouldn't that be nice! Whoops!, It was the "Boy Rangers Bill." Stranger things have happened. I hope to be like your Mr. Smith if you select me to be your Senator. I am the only potential Senator that is like you and I may very well live in your neighborhood. I ask you to send me to Washington, like Mr. Smith, to serve in the Senate of the United States. I hope there are approximately 32 additional new Senators sworn in when I have the honor to take office in January, 2013. God bless you all!